I read "It" many years ago when I was a kid. I also had nightmares for about a week about a clown that was under my bed chanting that "we all float down here." too. So thanks for that Stephen King. 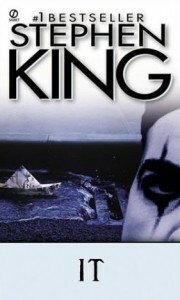 Though I find "It" brilliant and often cite this one as my favorite King book, there are still some problems with it that are hard to gloss over during my re-read decades later. You all at this point should know about one scene that pretty much had every reader going WTF. My WTF this time made me actually cringe while reading. It makes zero sense to the story and could have been edited out long ago. Also the flow isn't that great when we go back and forth between our gang called the Losers Club (Bill, Richie, Eddie, Stan, Ben, Beverly, and Mike) and other characters. The book truly shines when King looks at these characters as kids, they seem to fall apart a bit when we get to see them grown up and facing with their return to Derry. "It" was published in 1986. I read this when I was 10 (which would make that 1990) due to the television series coming out. I remember thinking that the series was the best showing the kids and it all kind of went to pot when we see them as adults confronting It again. There are some nice Easter eggs for constant readers to other King works ("Dreamcatcher", "11/22/63", "The Dark Tower", and of course King's latest "The Outsider"). There are a lot of characters in this book, so let's focus on just The Losers Club for this review. King shines when he shows us how this group of 7 kids came together and routed the boogeyman/monster that was hell-bent on murdering kids. Bill is essentially the leader of the club. When his younger brother Georgie is murdered, Bill is determined to kill "It." I was rooting for Bill throughout this book though there is some weirdness between about the fact that the woman he marries resembles Beverly (yeesh). Beverly (Bev) is the only girl in The Losers Club and has red hair. Each boy has a crush on her at some point during this story. I only bring this up because I watched Season Two of Stranger Things last year and the girl that joins the cast is called Max in the show. She's a tomboy and you can tell her home life is a hot mess. She also has red hair. While watching Stranger Things I started thinking about Bev from this book and how similar both characters were. The other boys in this story don't stand out as much as Bill and Beverly though. Ben I thought was great as well. A lonely and overweight boy, he ends up being a very successful adult. Richie ends up becoming a DJ. I felt sorry for Eddie and Stan and Mike the most though. Going into the secondary characters (people who tormented this group as kids and later as adults) gets a bit boring after a while. I thought King does a great job with the horror elements as well as the fantasy elements. Everything you read seems possible. The writing was very good though the flow gets clunky towards the end. At first you feel relief when you read about what the kids end up going through in the 1950s. I think King made a mistake though going back to the past and present (1980s) after each other though. After a while I wanted the story to hurry up and get going. Derry, Maine is the setting of "It" and seriously at this point you have to wonder about anyone living in that town. I do love reading this book mostly since this is the start of Derry being the place where funky/crazy things happen. We do get a sequel of sorts to this book in "11/22/63" where the main character in that book comes across some of the Losers. I thought the ending was so good, but once again sadness cause you have to know if this is a King novel not everyone makes it.